Bulgarian Prime Minister Boiko Borissov will join his Macedonian counterpart Zoran Zaev on March 12 2018 at a ceremony in Skopje to mark the 75th anniversary of the deportation of Jews to their deaths in the Holocaust. In doing so, Borissov will become the first Bulgarian Prime Minister to participate in anniversary commemorations of the deportation of Jews from the territory of the present-day Republic of Macedonia, the government information service in Sofia said. Together with Zaev, Borissov will lay a wreath in memory of the victims of the Holocaust. Representatives of the Bulgarian Jewish community will be part of the Bulgarian Prime Minister’s official delegation. In 1943, 11 343 Jews were deported to the Nazis’ Treblinka death camp from northern Greece and parts of Yugoslavia, then under Bulgarian administration. A Macedonian government statement detailed the two-day series of commemorations beginning on March 11, under the auspices of Zaev. The series was to begin with a wreath-laying at the monument to the deported Jews in Bitola and the monument to national hero Haim Estreya Ovadya, the Macedonian government statement said. This was to be followed at noon on March 11 with a symbolic March of the Living to the railway station, a Kaddish prayer in the afternoon in the Jewish cemetery and the opening of an exhibition “Diplomats Righteous Among the Nations”. The mayor of Stip was to hold an event in commemoration of the deportation of the Jews, with a wreath-laying in the city and floral tributes at the Jewish cemetery. The same day in Skopje was to see a floral tribute ceremony in front of the monument to the deported Jews and the monument to the fighters who fell in the national liberation struggle, the Macedonian government statement said. On the evening of March 11, a commemorative concert is to be held, to be attended by Macedonian President Gjorge Ivanov, the deputy defence minister of the State of Israel Eli Ben-Dahan, the representative of the American Jewish Committee and the representative of the OSCE office against anti-Semitism, Rabbi Andrew Baker, and the president of the Jewish community in Macedonia, Berta Romano Nikolic. The commemorative events programme continues on March 12 with a March of the Living in Skopje in the morning, ending at the tobacco warehouse which in 1943 was used as the location from which the Jews were deported. This will be followed by the wreath-laying at the monument to the 7144 Jews deported from what today is Macedonia, the event being attended by Borissov, Zaev and Berta Romano Nikolic. A commemorative event will be held at the Republic of Macedonia’s parliament. The Macedonian government statement noted that on March 5, the parliament had adopted a declaration on the 75th anniversary of the deportation of the Jews, and on March 6, the government of Macedonia adopted the working definition of the International Holocaust Remembrance Alliance’s working definition of anti-Semitism. Borissov’s visit to Skopje comes amid a significant improvement in relations against a backdrop of the good-neighbourliness bilateral agreement that has been approved and ratified by the governments and legislatures of the two countries. During his one-day visit, the Bulgarian Prime Minister will hold talks with his Macedonian counterpart. On the night of March 10, at a ceremony in the Central Synagogue in the Bulgarian capital, honours were conferred by the Organization of the Jews in Bulgaria “Shalom” on the Bulgarian government for its steps against anti-Semitism, including the adoption of the IHRA working definition of anti-Semitism and the appointment of a national co-ordinator of the fight against anti-Semitism. 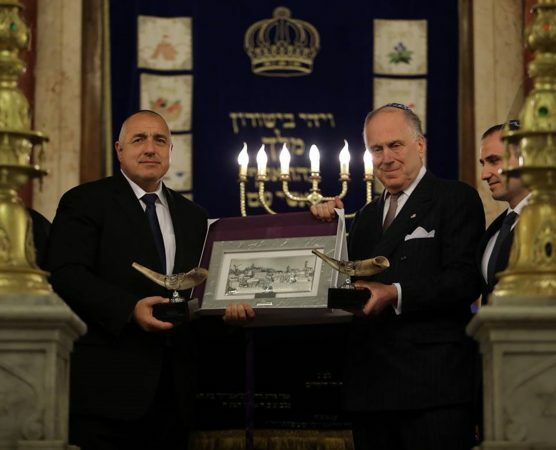 Bulgarian Prime Minister Boiko Borissov, World Jewish Congress President Ronald Lauder and the President of the Organization of the Jews in Bulgaria ‘Shalom’, Dr Alexander Oscar. Speaking at the ceremony in the Synagogue, World Jewish Congress President Ronald S Lauder thanked the Bulgarian government for its support of the Jewish community and its denunciation of the annual neo-Nazi march honoring Bulgaria’s notorious Nazi collaborator, Hristo Lukov. “The World Jewish Congress is grateful for the efforts the Bulgarian government has made to combat anti-Semitism. While we understand that you could not stop the Lukov march, it is clear to us that most Bulgarian citizens were disgusted by it. “And that’s in keeping with the fine traditions of your country. Today as Europe slides back into the old hatred of anti-Semitism, xenophobia, and bigotry, the EU is fortunate to have Bulgaria now in leadership. 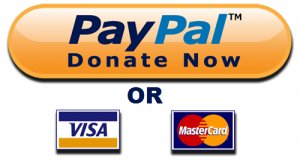 I believe Bulgaria will guide Europe at this crucial time with its strong moral compass, ” Lauder said. The World Jewish Congress president paid moving tribute to the fact that in 1943, the Bulgarian Orthodox Church, some political leaders, intellectuals and members of civil society, as well as ordinary Bulgarians, succeeded in their efforts to prevent the deportation of Bulgarian Jews to the Holocaust. He joined in mourning for the 11 343 Jews deported from the adjoining territories that were then under Bulgarian administration, to be murdered in the Holocaust.